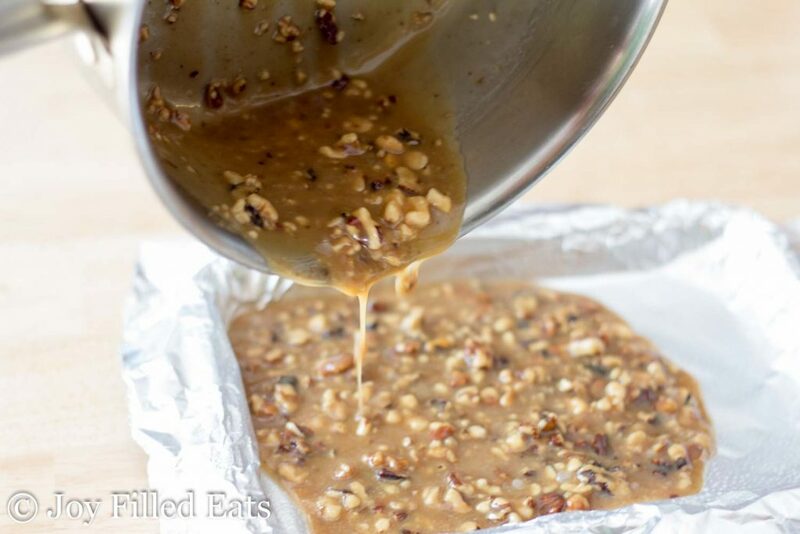 Buttery Walnut Toffee Candy. Homemade toffee is so easy but so satisfying. It looks and tastes like the expensive toffee bark in fancy chocolate shops. 99% of the time I make a recipe because there is something I want to eat. I love food. Since I don’t have any healthy candy in the house I had to make something yummy (before I cave into the Snickers bars in the grocery check out). 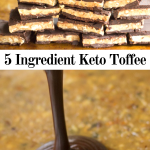 This has only six ingredients and is sugar-free, grain free, low carb, and THM S.
I had my Facebook followers vote on which post I should post today and this one won by a landslide. I’m not surprised because it is so good I hid this homemade toffee in the back of the fridge. And made another dessert for a party so I didn’t have to share these. Toffee is fairly easy to make. If you’ve ever made any kind of cooked candy before you can make this! You cook the sweetener, cream, and butter until it is thickened and golden brown, and pour into a tray. 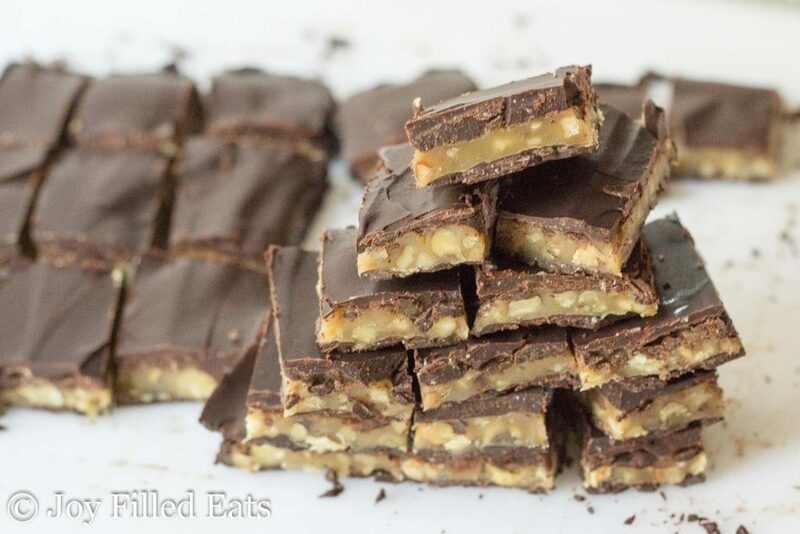 Cool, add chocolate, cut into squares and eat your toffee candy! I add the walnuts in the cooking stage so they get toasted right in the caramel. I have had readers simplify this by putting melting chocolate in a muffin tin with aluminum liners. Chill the chocolate, put the warm toffee on top, chill again, and then top with more chocolate. You get cute little circles that way and don’t need to flip the toffee over or cut it. That method can also help with portion control. 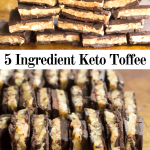 Looking for other easy keto candy recipes? Try my Caramel Pecan Turtle Bark, Salted Chocolate Almond Brittle Bark, Dark Chocolate Raspberry Truffle Bark, and Chocolate Chip Cookie Dough Bark. Enjoy your Buttery Walnut Toffee Candy! Homemade toffee is so easy but so satisfying. It looks and tastes like the expensive toffee bark in fancy chocolate shops. Line a small baking pan with foil and spray with cooking spray. Melt butter over low medium until it starts to turn golden. Add nuts and cook for about five minutes until they are slightly toasted. Add 4 tbsp of the cream and the sweetener. Cook until thickened and golden. This takes about 10 minutes. If it doesn't seem to be thickening you can turn up the heat to medium or medium high but stir constantly. It can burn quickly. Remove immediately from the heat and add the salt and reserved cream. Stir until smooth. 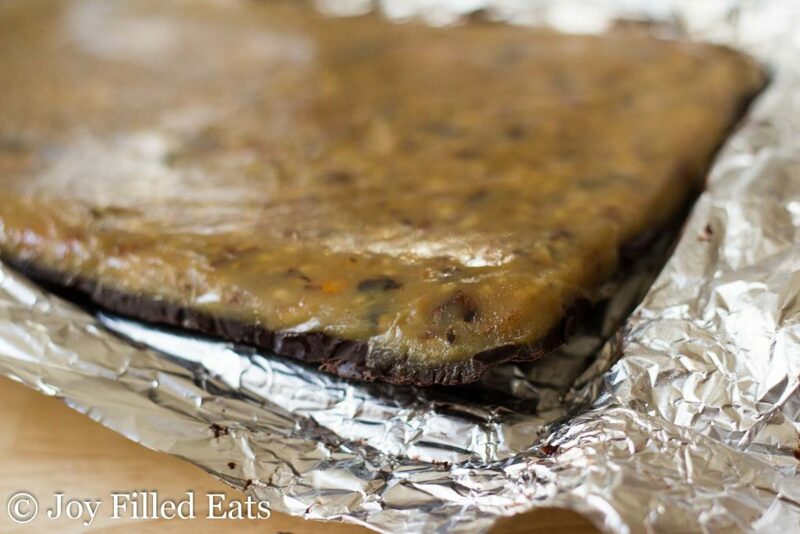 Pour onto the foil lined tray and refrigerate until firm to the touch (about half an hour). Melt the chocolate. I do this in a glass bowl in the microwave stirring every thirty seconds. Add sweetener if needed. 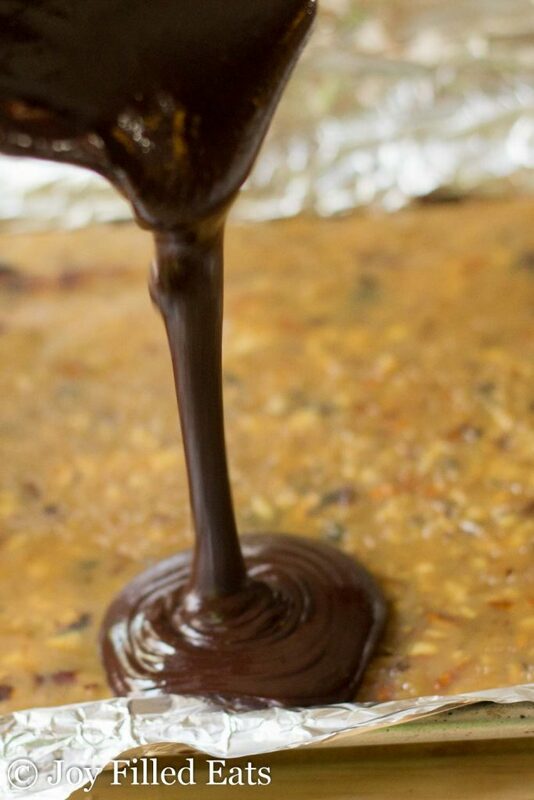 Pour half of the chocolate on top of the toffee. Put in the freezer until the chocolate is solid. Flip over the toffee bark and peel off the foil. Put the foil back on the tray and put the toffee on chocolate side down. Pour the rest of the chocolate on top. Refrigerate or freeze until firm. The filling stays soft like a caramel for the first few hours but hardens like a toffee overnight. « One Pound Better Stevia Giveaway! I just made these today!! I used part swerve and part monk fruit sweetener. The recipe made 24 perfect rounds in my mini muffin pan! Delicious! Thank you for the recipe! Maybe. Sorry, I can't guarantee it without testing. But a blend with erythritol like Lakanto might work. It's hard to substitute sweeteners in candy recipes. If you try please let us know how they turn out. Do you know if you could add baking soda at the end to make it like honey comb candy? I'm sorry but I have no idea. I've never made that before. If you try please let me know if it works! I made this toffee last week and unfortunately it didn't turn out well. I might have overcooked it, plus the chocolate didn't adhere to the second side. I tried again tonight, cooking it less and only putting chocolate on one side. It looks much better and I can't wait for it to cool. My question is, what's the best way to store it? Should it be kept in the fridge? You could cut it while it is still warm next time. Using a serrated knife can also help. Glad you like it! I was wonder if this could be done in silicon muffin pan, then once set dip them in the chocolate?? I may do a test run with just few. YUM!!! I am surprised this is so good and sugar free! I subbed the walnuts for almonds, and it was AMAZING! I didnt have xylitol, so I used a blend of swerve erythritol, monk fruit, and stevia and it still came out so yummy. I also only used half the recommended chocolate and poured it over just one side (an attempt to cut down a little on calories). This is a brilliant recipe and I'm so glad I found it!! I'm glad to hear it worked with those sweeteners! You do realize swerve is also erythitol? Lol you just doubled it. Swerve also has oligosaccharides and natural flavors. Would this work with monkfruit? Can't wait to try it! If you mean a blend that also has erythritol, like lakanto, I think so but have not tested it. SO happy to have found this recipe just in time for the Holidays. My daughter is so happy snacking on some right now. I used Pyure and it turned out perfectly. I subbed pecans for the walnuts because that's all I had. I will be making this often! I used Pyure the first time i made it and the butter separated plus it had a terrible bitter aftertaste, so the next time i used a combination of monkfruit sweetner and swerve and it came out perfectly. My new favorite!! Woah. Thank you thank you thank you thank you! Nut toffee is pretty much my dream candy, and with Christmas approaching and me being on a low-sugar diet, I thought I would have to miss out. Nope! Flavor is out of this world, creamy and nutty and sweet. I used Pyure sweetener and so I have yet to see how it will set up overnight, but I really don't care because even at it's current texture after an hour in the fridge, it's firm enough to cut. can't wait to try to make these! Hello!! These look amazing. I have a question - when I entered in the information, I got almost 200 calories per 1/12 of the recipe using the same ingredients as you, except for hazelnuts. The Lindt 90% bars seem to be the problem - 2 of them (3.5 oz each) are 1200 calories total. Did you get the same results? I can't figure out what is causing the discrepancy. Yes, that is correct. I just have the serving size set smaller. I have it set at 24 servings at 100 calories a serving. At the top of my recipe box it says Servings: 24. I totally missed that! Thank you so much. I made them tonight in a silicone square mold and got 20 servings. They are seriously delicious! just made this and it looks fabulous!!!! thanks for all the wonderful recipes you make.......5 stars for sure! Am I understanding the serving size for the buttery walnut toffee correctly? The recipe makes two servings and the macros for each serving is 21.9 grams of fat, 2.6 net carbs, 4.8 grams of protein, and 211 calories? No, the recipe makes about 12 servings. The nutrition is calculated for 1/12 of recipe. It depends how big you cut the pieces. You can make 12 big pieces or 24 or 36 small ones. I prefer cutting it smaller and eating a few little pieces. Oh no what do I do.. I tried making this tonight.. I added and the ingredients like so including the walnuts.. the mixture was kinda sticky with some loose butter still running when I layered it in the pan. Is this right?? I'm a little confused. So, you are saying some of the butter separated from the toffee? If that's what you mean it should be fine. I had exactly the same situation, I think I cooked it too high and it burned. Ive made caramel/candy before and usually have a creamier/thicker result but this was dark with more residue and the butter separated. Im pretty sure it is not going to end up toffee like but more likely chilled butter with residue in it. I should have known better as I had a nice thick result and then all of a sudden it thinned and separated. Its a delicate dance that toffee! ...surprisingly, despite the separation, after hanging out in the fridge for a while, the toffee still came out nice and crunchy, but there was a bit of separated butter (no much). I am pretty confident I overcooked it, but Im excited it is still edible and it tastes great. I might add a touch of vanilla the next time around. This was fantastic. You would never know that it was sugar free. I substituted chopped almonds since that is what I had on hand which led to a lighter coloring in the caramel. I used 1 bar of unsweetened baking chocolate for a top layer (omitted the bottom layer) with 3 packages of truvia to the chocolate. I think this is so good you could make it without the chocolate. This candy would be heavenly chopped up and added over no-sugar added ice cream. Thank you so much for this recipe. Thanks for the delish' recipe. Reynolds is now making Stick Free Foil (on one side) I picked some up the other day.......now this recipe will be my first time testing it! My mom and I have some major food challenges she’s diabetic and I’m deathly allergic to soy, red dye and food processing. So, for ur recipe i tweeked it just a little. I used stevia and black walnuts in the brittle and mixture of sugar free dye free soy free 75% carob chocolate which I melted in a metal mixing bowl over boiling water in my stock pot. Added a little cinnamon and some cayenne pepper some sea salt and 1/4 tsp of coconut oil. And then I made some caramel from scratch, drizzled that on under the chocolate. Tasting as I went. Can’t wait to serve it to my students tonight. Thank you for posting this. Oh my, what did I do?? Used erythritol and ended up with something the consistency of a praline. Sugary and grainy. Didn't cook for the whole 10 minutes but still burned it. So I tried to melt my Lilly's chocolate chips and it won't melt. Again grainy and thick. I'll eat it anyway. Tastes kind of ok. Sure it isn't the recipe and I'm just not meant to make this. Lol. Anything I could have done differently? Erythritol does get grainy. I think the blend of xylitol and erythritol works better in candies. How did you melt the chips? In the microwave? If even a drop of water is in the bowl they will seize and get grainy. We have a walnut allergy in our house but she's ok with all other nuts. Which one do you think would be best with this, pecans? I would use erythitol and add a few drops of liquid stevia if it's not sweet enough. What size tray did you use? It is about 7 x 11. Talk about joy filled eating! Oh my yum!!! This toffee is seriously amazing!!! I cut down on the chocolate on the top layer and just did a drizzle and sprinkled with a little sea salt. I seriously have to use all self control and only eat a couple small pieces. Thank you for this recipe. Can't wait to try some of your others!! The butter separated when inspired it into a pan. Any ideas on what I did wrong? Are you using my sweetener or gentle sweet? I used Swerve. Does that make a difference? Yes. I've only tested these with my sweetener. Sometimes you can't convert sweeteners in candy recipes. Valerie, did you also use swerve? I just attempted your recipe, only used Splenda instead of sweetner you listed. It all separated and never got thick. Suggestions?? This is so great!, love everything toffee!. Man I just love your recipes! 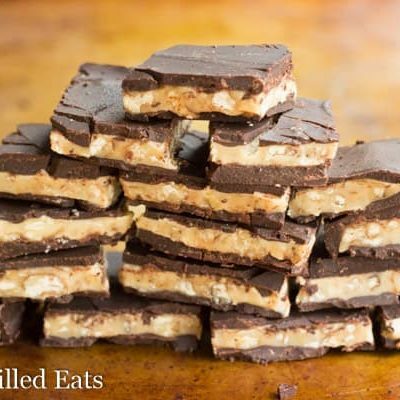 and this recipe is awesome, love toffee!. 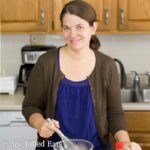 Can I use stevia baking blend? What are the ingredients? I've never heard of that before. My toffee turned brown, could it be the sugar I used? I used pyure. It's good, just not as pretty. Maybe. I've never used pyure before. Or you may have just cooked it a bit too long. As long as it tastes good I wouldn't worry. I'm not sure what I'm doing wrong, but it just didn't thicken up and get like toffee and I'm not sure if it's the type of sugar substitute or what I even turned up the heat and I only got a fudge type toffee ugh ? can you please tell me what I have to do to get this to work I've used 4 types of sugar substitute including the one you recommend. Thanks for for your help. Hi Wendy, this won't get as firm as a sugar based toffee but it should get crisper than fudge. How long have you been cooking it for? Living in Uganda I don't have baking chocolate or dark chocolate. Anyway I could us Dutch cocoa powder? Yes, if you make it into skinny chocolate. You mix cocoa powder with coconut milk and sweetener. You would have to keep it in the refrigerator or maybe the freezer. 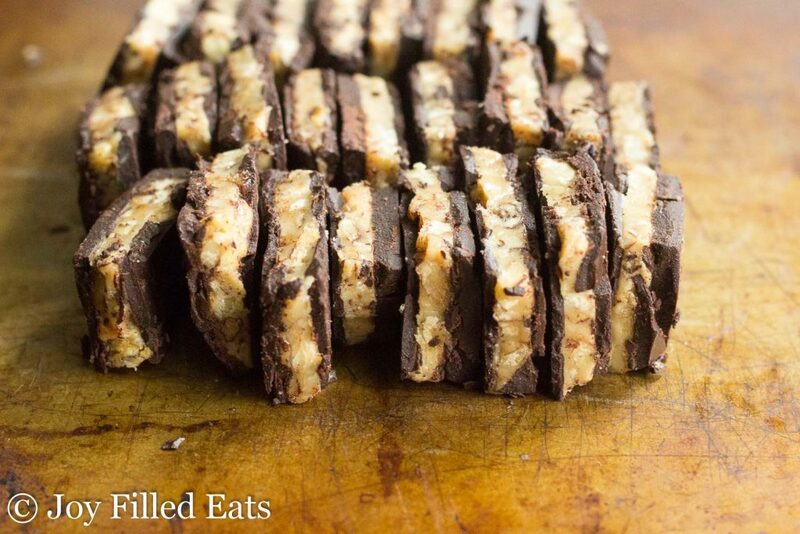 Do you need a recipe for skinny chocolate? Thanks. No, I have the cook book. I will give it a try. I ordered sweetener that will be here in about 10days (friend hand carrying it for me ❤). Appreciate your help. Such a great recipe and just in time for the holiday season which will be soon upon us! My husband would love this! Wow! 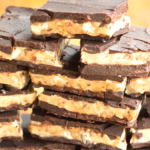 Chocolate and toffee - my husband loves toffee! Thanks for the recipe! Oh my goodness, those look crazy good! I'll measure it tomorrow but I'm pretty sure it's 10 x 13. It's a pampered chef sheet pan and I think it's the medium size. I was wondering if I could replace the walnuts with either pecans or almonds? Love toffee just not crazy about walnuts. Absolutely :-) I was thinking these would taste like a Snickers with peanuts.